Oh dear ……I’ve seem to have spent the last 16 weeks thinking of nothing but the end of my time at Brookhouse Wood. Well, I suppose after 11 very happy and fulfilling summers, that’s only to be expected. The final run of courses in September were often hectic but I believe they were well appreciated – and they helped fill the coffers to get me through the coming winter. The final party was superb and I was delighted that so many of the ex-assists turned up to share it. 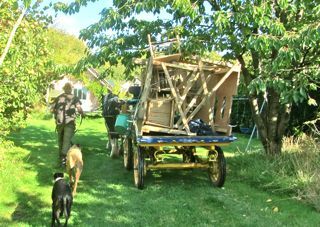 The memorable Transhumance procession was recorded by my friend and colleague, Leo (I’ll try and add the link to his Vimeo) and the following night curled up in the hay around the fire, watching the lunar eclipse will never be forgotten. 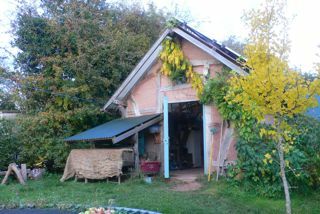 Since then, I have spent 3 weeks tidying the workshop at Brookhouse Wood for Will & Bryony who have taken over the farm and for Will & Penny, who will be looking after the workshop and the new glamping enterprise. 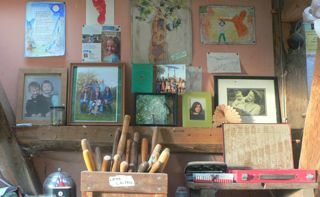 The idea is that a wider range of courses will take place at Brookhouse Wood, including not only Barn the Spoon and his organisation, The Greenwood Guild but also course like yoga and painting. 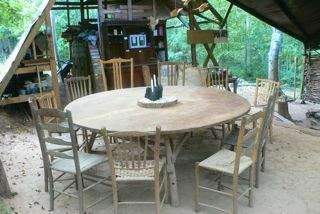 The oak dining table will remain along with 11 greenwood chairs, some made by myself and many more made by past assistants who have been trained at the workshop over the last decade. 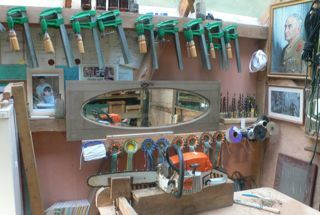 I removed most of the gubbins I had accumilated over the years, and had to squeeze it into my much smaller workshop at home. The last few days have been spent arranging it all to fill every space, while not disturbing too much, the family momentos at one end and the ‘boys stuff’ at the other end. 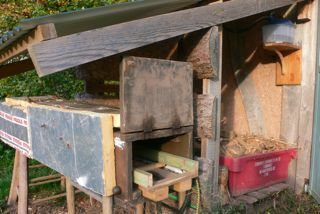 I then set about restoring my old plywood steam-box, which now sits in a handy space next to the woodshed, that had been occupied by the lawnmower. I found an old shelf for the electric boiler and fed the cable through the wattle-and-daub wall to connect permanently to the mains. If I do my steam-bending on a sunny day, the new solar panels on the workshop roof should easily generate the power required, saving the need to keep stoking the fire beneath a 40-gallon drum. 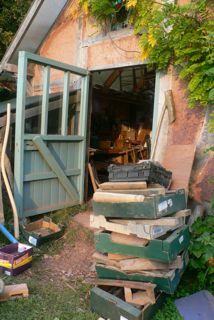 The forthcoming projects are to convert an old cupboard into an electrically powered kiln, and then to build a new tarpaulin covered area for running courses next summer. In the meantime this winter, I plan to write the 3rd book in the current trilogy entitled ‘Square Pegs in Round Holes’ describing the years at Brookhouse Wood, while also containing several chair-making updates on ‘Going with the Grain’.